neat. Im gonna try that with mine. When I click the above film clip, it takes me to your photobucket acct. but there is no vid. What gives? Maybe it has something to do with your system security. Shut your pop up blocker off temprarily, see if that works. I think it worked for cadyak. Daren was the one that came up with the idea. Good News about the StarLyte UltraLyte. You can now simmer with it by putting it inside of a Fancey Feast or Friskies cat food can and also potted meat cans of the same size. I was able to simmer 2 cups of water for 22 min. with 1/2 ounce of fuel. The temperature was held at 198 degrees with the lid on. Last night I made quite a few tests to see how the simmer device works. Tests were consistantly positive. It's easy to pick up the stove once a boil is acheived and place it into the pot and return the pot of water to the stove. This method of simmering may work on alot of existing stoves. This idea originated in a thread started by DarenN. He devised a means of simmering with the Fancee Feest stove. It's amazing how ideas can create new ideas. Thank You Daren!!!! The video is not a video it is a lazy mans way of presenting an idea instead of doing a real live video. It is 3 photos made to look like a video aka lazy mans video I'll do some searching to see if Daren has a video of his simmer device. 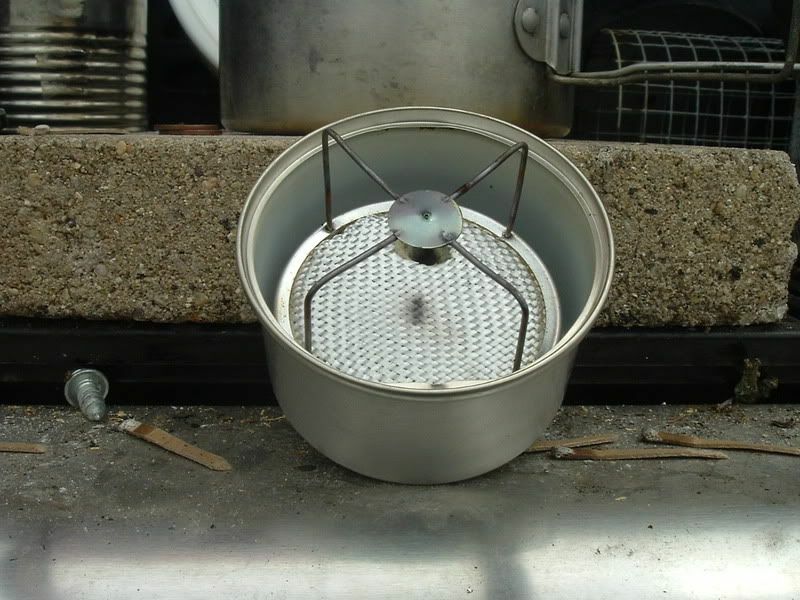 Here is how I used the StarLyte stove that has a modified burner inside a cone shaped windscreen. 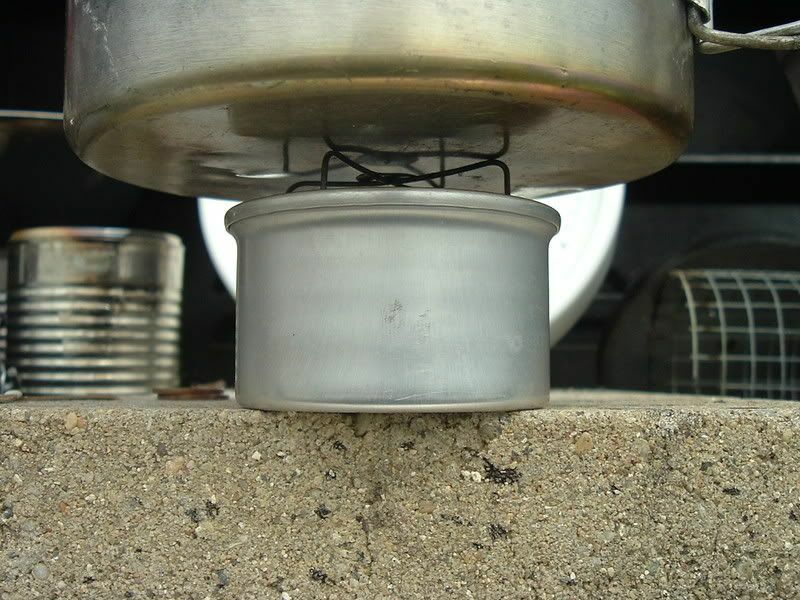 The surface of the burner has been reduced to burn efficiently inside the enclosed area under the pot. Notice that I place the windscreen very close to the pot. 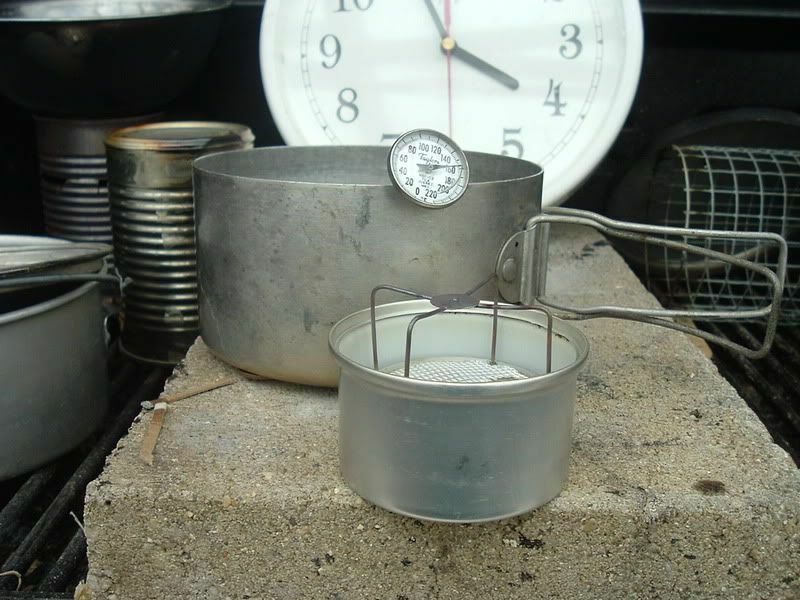 Take a look at how the burner portion of the StarLyte stove is being used with Trail Design's "Caldera Cones"
Chad Poindexter at StiksBlog http://sticksblog.com/2013/05/03/td-s... shows us how he uses the Modified burner. It's almost too bad that the StarLyte is so well known. He forgot to put your name in the comments portion of the video. At least he mentioned it in the video itself. sudden wrote: It's almost too bad that the StarLyte is so well known. He forgot to put your name in the comments portion of the video. At least he mentioned it in the video itself. Next I dug through the overflowing box of stoves in my gear closet and tried a few of them. Of course they all worked, but to be honest, I had grown interested in the Starlyte alcohol stove which Zelph sells, and so I ordered one. (At only $14, it was an easy decision.) What drew me to this stove the most was that it did not need to be primed, unlike so many of my other alcohol stoves. However, this stove also offered a few other interesting features, namely that it came with a lid which can help contain any unused fuel (although, I am still leery about that) and that it is so compact.